We take care of all importing and exporting complexities, so you can expand your horizons. and secure way to move goods. We offer scalable solutions, so you can dream as big as you want. We take the pain out of customs brokerage, so you can move goods to and from anywhere. We deliver insights from your trade data so you can make smarter business decisions. Profound changes in global trade are creating unpredictability. Trade deals are being signed and revisited; tariffs are being imposed; regulatory and customs processes are shifting. But change doesn’t have to be disruptive. Are you ready for Canada's Single Window Initiative? Learn about the program, key dates and developments, and how you may be impacted as an importer. We have what you need to do to keep your shipments moving. For Livingston, no customer is too small. We’ve succeeded because we pay attention to our small business customers. We know the unique requirements of low-volume importers, and have tailored a set of services to your needs. You have a single shipment going to the United States or Canada, but it’s an important one. You need help to get it moved from A to B, and through the border on-time and hassle-free. You have two or three shipments a month. But shipping isn’t part of your regular business process and there’s no time to become an expert. Whether you’re small or large, you need help overcoming these challenges. As a carrier or driver, customer service is your top priority. We’ll help you navigate the border quickly and deliver on your commitments. We can even help you offer additional services to your customers. Your goods will move faster. Duties, licenses, permits, and all other brokerage requirements are handled expertly for optimal clearance. Total import/export compliance services for large multi-national companies. Don’t let your operations impede your opportunities. Ocean Freight. Air Freight. Freight Management Services. Project Moves. Barge Services. Cargo Insurance. Ground Freight. Import documentation. Export declarations. Bills of lading. End-to-end trade technology solutions for flexible and agile supply chains. Manage your critical customs and freight information. Get visibility into your operations. Over 30 years of experience shipping all types of vehicles cost-efficiently throughout Canada and across the U.S. border. One vehicle or a fleet, we’ll get it there with care. We hone your productivity by designing and managing your programs, information needs, and contact center services. Don’t let your valuable, perishable items sit idle due to compliance or logistical issues. We can help. With over 70 years of serving the just-in-time needs of the auto industry, we know your challenges. With Livingston, your goods will reach your customers in optimal time at lower cost. Trust Livingston to meet all your special requirements for faster clearance and fewer delays. When shipping across borders, you need certainty that your oil and gas products will move without delay. Speed up your retail supply chain and stay ahead of the game. With Livingston. We ensure your supply chain is world-class, so you can stay at the forefront of innovation. We've tailored an entire set of services to the needs of low-volume importers and exporters. End-to-end solutions for carriers and forwarders and preferential rates for association member organizations. Trust Livingston’s industry experts to keep you up-to-date on the Canada-U.S. softwood lumber dispute. Clear customs and borders without delay. Our experts handle the details: duties, licenses, permits, and all other brokerage requirements. Get trade advice from the experts. Quick access to a wide range of technical knowledge. We make everything understandable: costs, licensing, classifications. 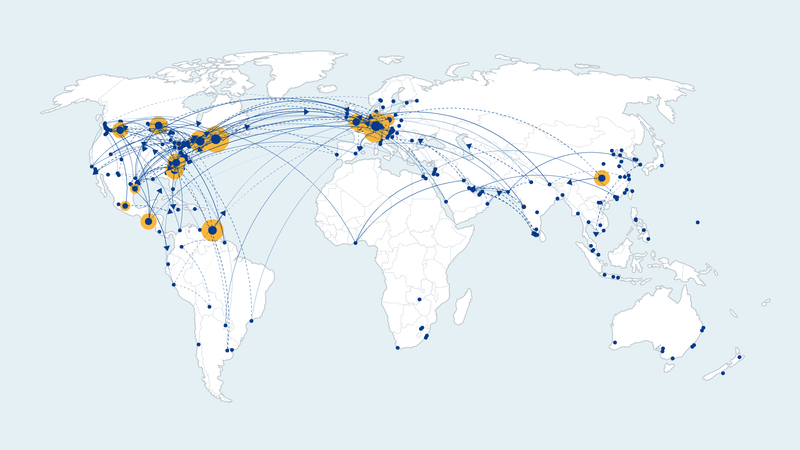 Move your goods optimally within North America and around the world. We arrange efficient transportation by air, sea, rail, truck, or barge. Moving a vehicle? We ship all types of vehicles cost-efficiently throughout Canada and across the U.S. border. One vehicle or a fleet, we’ll get it there with care. Be sure. With Livingston. Whatever the size of your company. More than a broker, Livingston is your business partner in customs, freight and trade compliance. Our services and solutions are built around you. Whatever you need. Livingston is here to help. Resources and webinars. To help you trade better. With more than 70 years of experience in customs brokerage and trade management, we have a considerable amount of accumulated knowledge. Benefit from our experience. Learn from our experts. We bring together a carefully selected collection of articles, written by our global trade experts. These articles cover the most current and relevant topics in international trade, and provide important insight into how importers and exporters may be impacted. 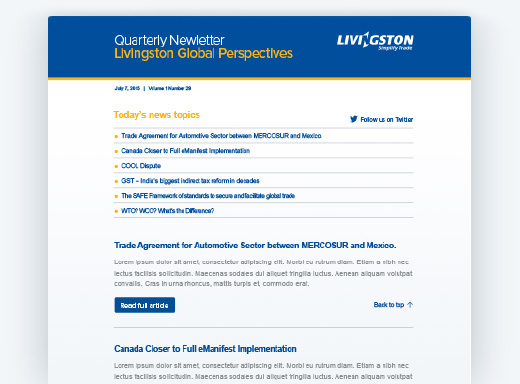 Stay up-to-date on trade-related news. Be the first to know.